Nvidia has released a video teasing its upcoming RTX 2080 graphics card. Despite my (misplaced) confidence that Nvidia wouldn’t jump the gun and go straight to 20-series, the latest teaser vid makes a strong case than the next generation’s launch flagship will be called the RTX 2080 and will be based on the Turing GPU architecture. The video titled ‘Be For The Game’ was posted to Nvidia’s official GeForce YouTube channel. The teaser trailer is jam-packed with hints to the near-imminent launch of the next GeForce graphics card, and is accompanied by a short description with only a location and date: Cologne, August 20 2018. In almost every shot of the video there’s a cryptic clue as to the details of the upcoming GeForce graphics cards. 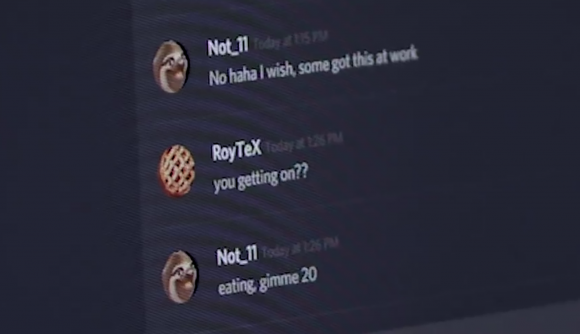 For the most part, clues are hidden in the messages and usernames of gamers in featured in the video, and it’s definitely worth watching to spot them for yourself (warning: you may get seriously hyped up). It’s not quite Alan Turing code breaking-level, but kudos to the users of the Nvidia subreddit for figuring it all out so quickly. Not_11: If the above wasn’t hint enough. “50.968495,7.014026”: the coordinates for a location in Cologne. 20.AUG.2018: appears on screen with the numbers 2, 0, 8, 0 animated in order. So there you have it. In what seems like a fitting tribute to the man behind the upcoming GPU architecture’s name, Nvidia has detailed everything about its RTX 2080 graphics card within veiled messages just waiting for engaged users of the community to piece it all together. The Nvidia Turing GPU architecture was announced at the SIGGRAPH 2018 event in the early hours of this morning for us brits. The architecture features dedicated ray tracing hardware, AI Tensor Cores, multiprocessor tweaks, and even a USB Type-C port adhering to the VirtualLink standard. The first cards announced with Turing will be the Quadro RTX 8000, RTX 6000, and RTX 5000 – which are set to launch in Q4. Nvidia’s GeForce Gaming Celebration is only six days away. The event is being held on August 20 in Cologne just a day before Gamescom kicks off down the road. We’re sure to hear all about Nvidia’s upcoming graphics cards at the event, and now that the cat’s out of the bag it won’t be long until specs, performance, availability, and, if we’re lucky, price will all be public knowledge.